By far, the most common question I’m asked about my OCD is how did I beat it. How did I recover? What methods worked? How long did it take? OCD took me by complete surprise. I never knew that a disorder I had always thought of as a “glorified cleaning disorder” could actually revolve around harm. I didn’t know that the severity of my harm obsessions were propelled by my mind’s overwhelming need to protect my kids. I didn’t understand that the reason I couldn’t get the thoughts out of my head was because my brain began to think that without watching out for the thoughts, acting on them was a possibility. I spent weeks and months suffering in silence. I stayed silent because I was afraid. I stayed silent because I was having an identity crisis. I stayed silent because even though the suffering was unbearable, at least the damage was only in my mind. Only happening to me. I feared that reaching out for help would put my family at risk. I felt that once people saw how dark my thoughts really were, they would take my kids from me. I was afraid I would end up in a hospital against my will. I worried about what my family would think of me and how my extended family would react. I was raised to be a nice (though outrageously outspoken) Christian girl whose thoughts would for sure cause others to question my morality. So I stayed quiet, I stayed quiet to stay safe, but eventually I could no longer stay quiet. I slowly began reaching out to different people, sharing parts of my fears with only those I truly trusted. Each and every step I took toward my recovery was very calculated. I did a lot of research before calling the therapist I decided to begin seeing. I tiptoed around the cause of my anxiety with my doctors. I clammed up when our pediatrician asked if my fears revolved around the kids. I only opened up as much as was completely necessary to begin getting help. I only began opening up because I thought that if I didn’t, OCD would somehow kill me. I don’t share the fact that I thought it would kill me lightly. I want to make it clear that I never at any point was suicidal, but I felt that somehow, someway, OCD would kill me (almost as if it was a separate entity from myself). Once I began drowning in the thoughts and the shame, I became utterly hopeless. The depression that followed wasn’t just me being “sad”. It was an overwhelming feeling that there was no way out of the mess I had made. I felt like I would never be able to stop the thoughts, and even if I did, I would never be able to undo all of the damage they had done. I would never be able to “make it up” to my kids. I would never be able to forgive myself. Depression for me wasn’t just crying (though there was much of that), it was a fundamental belief I had that something bad was going to happen and I had no idea how to save myself from it. For the reasons I’ve shared above, I’m putting together a list of “keys” for others to use in recovery. I want others to suffer less and for a shorter time than I did. I want others people to know it’s okay to reach out. I want my “last resorts” to be other people’s first options. I want to take the knowledge I now have looking back and use it to help those who are currently at square 1. Here is your first step toward recovery, let the closest person to you know what is going on. The first step is always the hardest, but it is so important. The people who love you can’t help you fix something they don’t know you’re going through. Telling that first person will help you not feel so alone, it will also aid you in reaching out for more help. Use that person as your “wingman” in finding further help and support. There are a couple of different kinds of therapy for OCD. Mine was mostly talk therapy, but there is also Exposure and Response Prevention (ERP) where you confront your fears (intrusive thoughts) head on and discontinue your escape response to them. I found my therapist by searching “OCD Specialist (my home state)” and was able to read through different profiles until I found the therapist I felt comfortable reaching out to. This method may work for others, but what I would recommend trying first is calling Postpartum Support International’s Warmline at 1-800-944-4773, there you can find information, support, and resources. You can also find them online at www.postpartum.net, here there is a lot more information and stories that can be helpful in answering any questions you may have. I’m not saying you need to tell all of these people your life story, but let them help you. Let them make you a meal or babysit your kids. Let them drive the carpool or bring you some tea. Let them be there for you in the way that you would be there for them. Needing help doesn’t show weakness, accepting help shows strength. Moms always want to have it all together without “needing” outside help. I’m here to say that I KNOW you can do it without help, but you don’t NEED to. There is no award for struggling harder and longer, please give yourself a break and accept all the help. I know, I KNOW. I didn’t want to write this, but it was truly a lifesaver for me. I tried essential oils, working out, drinking more water, positive mantras…you name it, I tried it. I finally reached out for medicine because I was desperate for relief and guess what, I got worse! The first medication I was given didn’t work, so I tried again to fight without it. Eventually I tried a different medication (actually a couple combined) and I FINALLY had relief. I wish I wouldn’t have thought of medication as something that made me “weak” or something that I didn’t need. I wish I would have tried a different one sooner. I wish I would have done just about every one of these steps sooner. So please, if you need medication, get some. I needed the medication in order to “quiet” my mind. Without it, I wasn’t able to even focus on recovery because I couldn’t get my mind to stop buzzing. Once I was on a medication that worked, I was able to get rest and think clearly again. I’m not saying you need to take medicine to recover, but I am saying please don’t feel bad about doing it. It doesn’t make you weak and there are ones that are safe while pregnant and breastfeeding. Sometimes your body just needs a “reset”, that doesn’t make you broken, it makes you human. Please, please, please, unplug! Stop Googling. Stop watching the news. Stop looking for answers on Facebook. You. Must. Stop. Within the past two weeks alone I have seen a couple of viral stories about moms and postpartum depression that I’m sure scared a few of you. Right now, I need for you to not focus on them. One of the most important things a therapist ever told me was to “focus on myself.” I was so busy letting other people and their stories scare me that I forgot to focus on my story and my family. Recovery takes much longer when you keep hearing, seeing, and reading things that scare you. I spent almost a year barely looking at social media and pretty much only watching HGTV (I heart Chip Gaines). I was protecting my mind from outside influences and it was one of the best decisions I made. By this I mean more professional help. I needed more help. I ended up at an outpatient program for new moms at a hospital in Minnesota. Four days a week for three weeks, I took my son with me to outpatient treatment. I was reluctant to go to outpatient. I was embarrassed. I thought I wasn’t the type of person who needed it, but I was. I needed more therapy, more support, more information, I just needed more. I went to The Mother Baby Program at HCMC (in Minnesota), which at the time was 1 of only 4 programs like it in the country. If you just need “more” they can be reached at 612-873-6262, or visit them online at HCMC Mother Baby Program. This one is the reason I’ve taken to long to write this post, because I hate that none of these are “overnight” fixes. I feel so helpless when people reach out to me and no matter what I tell them to do, they will also need to be patient and take time to heal. In all, it took me about a year and a half from my “first thought” until I considered myself completely healed. I went through many different “phases” of OCD. My longest phase was the one where I was almost better, but still felt like I had a “monkey on my back.” There was always this small remainder of OCD, this feeling that it was always waiting for me to pop back up again. I would say this was about 9 months of my recovery. The “almost there” part of recovery. That was one of the hardest things, I began to come to terms with the fact that I would never truly be better, but even that passed. That small tug in my heart where the fear of OCD was went away. All of it. Thank you so much for your post and blog. I am currently going through this and it’s incredibly encouraging to hear from someone who has lived through it! It’s a difficult time, but you’re giving me hope! I was wondering if you had a post or if you will have one in the future on how your spouse and family can help? My family asks me how they can help, and I struggle giving an answer other than “try to distract me.” Also, would it be okay to link back to your blog from mine? 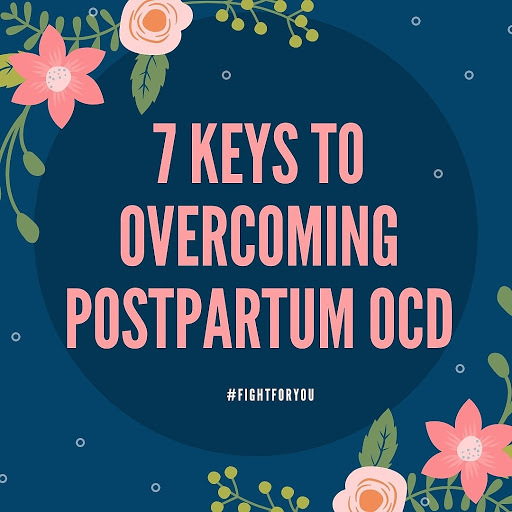 Thank you for sharing, my perinatal OCD has been so difficult to deal with and it took me around 9 months to really reach out for help. I am currently in that “monkey on the back” stage you were talking about but I do feel SO MUCH better after receiving help. Thank you for being open and honest and giving hope to those that are suffering. thank you for sharing your story. Can I ask what medications worked for you? I actually had a bad reaction to a very commonly prescribed medication, which was really scary for me. In the end, I ended up on Paxil-then switched to Lexapro when I decided to get pregnant again. I was also put on an anti-psychotic for a short while to help with the thoughts while the Paxil kicked in. I’m still on Lexapro-4 years later and plan on staying on them. Through all of this I realized I’m just a super anxious woman who probably would’ve benefited from meds earlier in life. Lastly, I do have a fast acting/non addicting medication for when I have sudden panic. Hope this helps! What works for me won’t work for everyone, so don’t look at it as anything other than a general idea of how one person worked through OCD.